Every month the column TUX&GNU@school  reports about free software, a homepage on the topic and an easy to implement idea. This month I talk about Tuxpaint , a free painting program for children, about "Debian  at school" and about the idea "Easily understanding large numbers". Welcome to the 5th edition. As I promised last time, there are some news today. This is the first edition released under the roof of the Free Software Foundation Europe  and the GNU project. In this context TUX&GNU@school will be released in different languages in the future but right now only in German and English. All earlier edition are in english available too (TGS 1 , TGS 2 , TGS 3  and TGS 4 ). If there is anybody reading one of the older editions who want to implement an idea, go on. At this point I want to thank Christian Selig and Kristian Rink for their support with writing and translating. But we don't want to lose too much time, therefore I move on to the program introduction of this time. 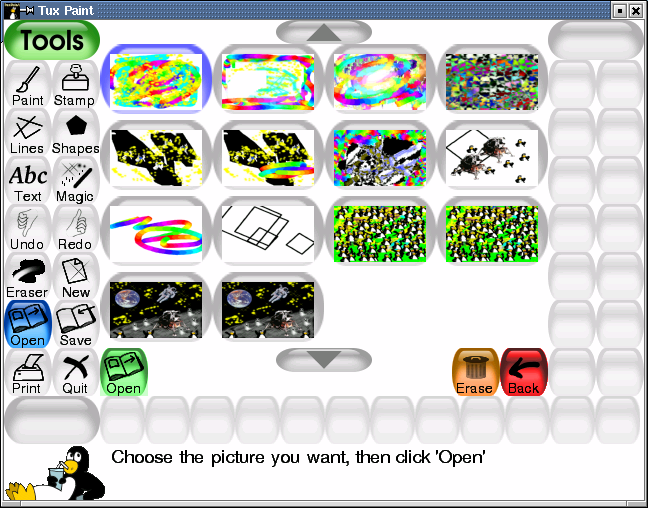 Tuxpaint  is actually a free painting programm for children which is released under the GNU GPL . I wrote "actually" because I heard of many adults who can't stop painting with tuxpaint ;-). I tested the version 0.91. of the 16.11.2001 under Debian GNU/Linux  testing/unstable. On Debian you can easily install the program with the following shell command: apt-get install tuxpaint. The version 0.9.2 is the most up to date one which is available in numerous languages. These are e.g. German, French, English, Danish, etc. to name only a few. You can find the full list on the homepage of the project . What we surely should mention are the ports to the common platforms, such as GNU/Linux, Windows, MacOS X and FreeBSD. As with all Free Software, the sourcecode is available, so there shouldn't be a bar to other ports. When you start Tuxpaint either over the console or by a click on the corresponding icon, Tux with a brush in his hand appears. After a click in the window or a few seconds of waiting a screen as shown in screenshot 1 comes up. The interface is divided into five sections. On the left there is the tool panel, containing different tool groups, as well as general functions such as Print, Save and Quit. For each tool group, there are different choices on the right. An example for this are the different painting sizes of the color brush. A further example is shown in screenshot 1, that is to say the really numerous stamps. Whenever it's possible to use a color with a certain function, the choice can be made in the second last row. Right beneath, Tux, the little penguin, sits around, always saying something about each action. Either he gives tips or he explains on what you are clicking or what an selected stamp is showing. And eventually the most important and largest part of the screen viz, the artist's canvas which is situated in the middle. As you can see in screenshot 1 I made already some art ;-). At the moment I have to brace up that I'm not painting and playing with Tuxpaint, but continuing this column. 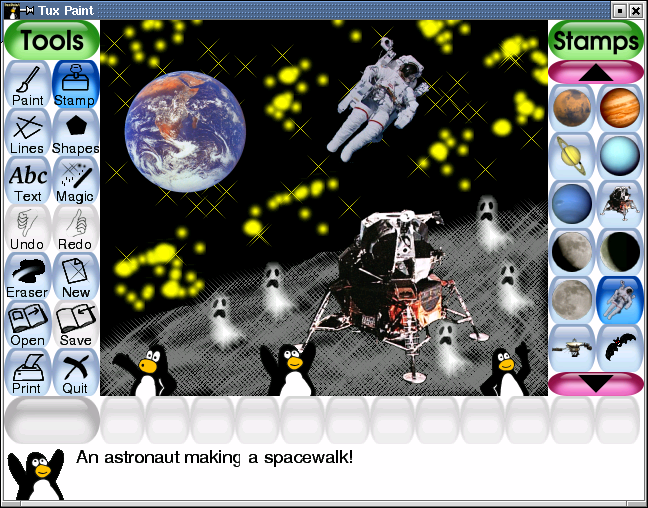 So as every good program for infants there is a sound for each action and for every click in Tuxpaint. For instance, when you use the rubber it sounds as if you really used one on your screen. This property is special with the stamps. The numbers for 0 to 9 are spoken in english and when you select the ghost stamp, it right then begins to ulutate. An the other hand when you select the moon landing vehicle, you can hear Neil Armstrong saying his famous first sentence. And there are a lot more of these special sounds for the stamps. As already mentioned the program is made for infants in the first place and therefore the Open dialog is made quite easy as you can see in screenshot 2. It's not necessary to click trough many directories till you find your picture and in any case you don't know what picture it is by means of the file name. In Tuxpaint the artist simply clicks on the Open button and then chooses the right picture in the window which appears where the canvas was before. You may also delete one of the pictures right here. By the way, under GNU/Linux all pictures are saved in a directory called .tuxpaint/saved which is always situated in the own home directory. The pictures are filed in the PNG format which is a free and standardised format. Even easier is printing. You have to simply click on Print and the picture gets printed, provided that mum or dad installed the printer correctly. When you then accomplished it once to stop painting and you leave the program, of course Tux is pointing you out that you didn't save your picture yet and gives you right now the possibility to change this. I hope that all these who didn't know Tuxpaint yet now have a good mind to try it out. Tuxpaint is really a genial part of software that you can't keep back to your children. Therefore a large "thank you" to Bill Kendrick for his software masterpiece and we are all anxious to what you will create in the future. But now continues to the topic "Debian at school". Debian Jr.  - "Debian for children from 1 to 99"
But before I come to the single items it's perhaps useful to introduce Debian in the first instance. Debian is a project which, quite similar to Linux (the kernel) itself, is developed and supported by volunteers from all over the world. Surely the most well-known distribution of this group is Debian GNU/Linux which is available for 11 hardware architectures  until now. Furthermore there are projects with other kernels, such as Debian GNU/Hurd  and Debian GNU/FreeBSD  (NetBSD) , plus other subprojects . Debian Jr. , as the title already says, want to make the Debian distribution easier and more attractive for children. Thereby the primary target group are children up to eight years. When once the distribution is adapted optimally for children of this age they want to repeat the same thing for children between 8 and 12. The subproject provides numerous Meta packages  which are packages containing thematically sorted programs. Furthermore they want to provide means for parents and administrators too to customise the system to the new target group's needs. Of course as usual with Free Software Debian Jr. cooperates with related projects, such as, for example, the SEUL/edu project which has been introduced in the 4th edition . What's just as important for the young debian users is the adaption to their mother tongue. This is a goal for Debian Jr. too, but right for this there is another special subproject: DDTP . The DDTP - Debian Description Translation Project's  original goal was the translation of all package descriptions into all languages spoken on this planet. In the unstable version of Debian there are meanwhile more than 10000 packages, which means a lot of work. And even though, if I remember correctly for some languages already all packages descriptions are translated. As already indicated above DDTP currently limits not only to package descriptions but translates also texts of debian-own configuration tool debconf and will probably also help or do the translation of the new "debian-installer" . By the way it's very easy to help with the translations, you need only an email client and the very good written instructions  of Michael Bramer, the project founder. DebianEDU is still quite young. It was founded by Raphael Hertzog in September 6, 2002. According to the homepage  the main goal is to create the best GNU/Linux distribution for schools and education. DebianEDU originated in the French distribution with almost the same name  developed in France specifically for this task. The knowledge and programs made for and with this work are intended to flow into the project and they shall be pursued and completed. In contrast to Debian Jr. they focus on software which could be important at school or in education in general. Of course there are several overlappings but by tight cooperation they avoid doubled work. Here too they grapple with the production and provision of meta packages which are already now rather numerous . The fourth and last Debian project I want to introduce here is likewise still very young. 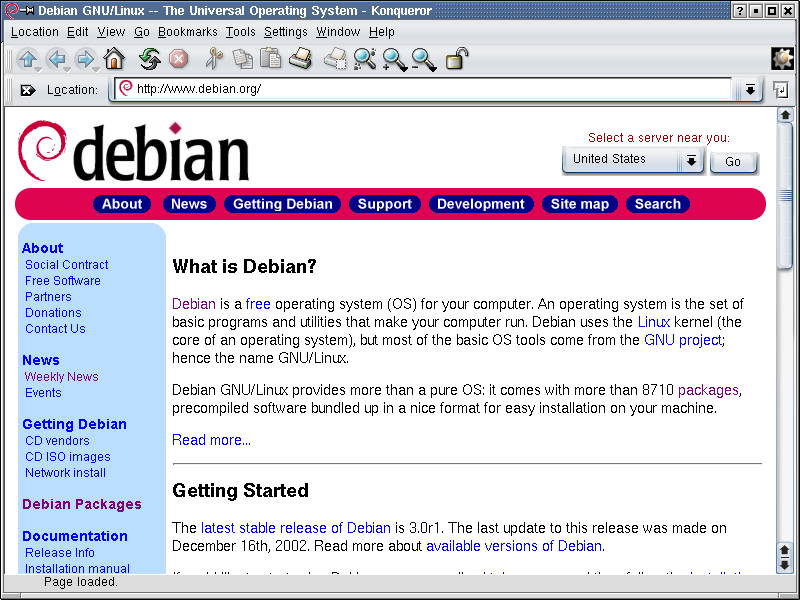 The goal of Debian Desktop  is it to make Debian GNU/Linux easier and more attractive for desktop users. Its aims such as an easy installation with integrated and automatic hardware detection are on the to-do list, just as the provision of graphical configuration tools like Webmin . Debian GNU/Linux is not only a manifold distribution, it is also the groundwork of many more or less successful commercial distributions. Beneath commercial derivatives like Libranet , Progeny , Xandros  or Lindows  which are unfortunately frequently mixed with proprietary software there are however free projects too which are built on the stable foundation of Debian. The most important example of this kind is Knoppix  at the moment. Unfortunately even this distribution isn't entirely free from proprietary software. Knoppix is a distribution running completely from CD-ROM which isn't only useful for demonstration purposes. But more infos about this below. In contrast du vanilla Debian, you can worrilessly recommend Knoppix  to absolute GNU/Linux newbies too. But now we're going on to the software idea of this edition. Something which is no problem for most of us, it's especially pupils in the lower classes that still have to learn it grindingly: Large numbers. What I mean with "Large numbers" is not imperatively one million or larger but already 100, 1000 or then 10000. With numbers up to 100, it's mostly possible to represent them with everyday and eidetic examples, forming a base on which children can imagine the numbers in an abstract form by and by. But then with numbers larger than 100 it becomes more difficult to find examples, let alone to plot them. Well in this range of numbers you begin to abstract the numbers i.e. to separate them from concrete measures and values. Here in Switzerland, but probably not only here, in many cases little wood or plastic cubes are used. These are approx. 1 x 1 x 1 cm large and ten of them in a line result in a decadic row. Ten decadic rows side by side result in a one hundred field and ten of these fields, one stacked on the other, respectively side by side then result in a one thousand cube respectively in a one thousand field. The largest still useful applicable field is the ten thousend field which consists of 100 one hundred fields aligned in a square. I hope that the people who not already knew or saw these fields and cubes can imagine them on the basis of my descriptions. Well but what and how shall you transform this into software ? I would like to see that handily OpenGL  or general 3D programmers generate these fields and cubes three-dimensionally and show them on screen. If children not only have to imagine this numbers but also can see them on screen, it would be much easier for them to calculate with large numbers. Perhaps they can even enter numbers into the computer and it generates the corresponding field and cube forms. On the other hand it would be interesting to see calculuses in these forms. The pupils then must calculate them with help of the 3D objects and afterwards they could compare their result with the computer's one. Well, it would be nice when I  receive some implementations until next time which I then could introduce in TUX&GNU@school 6 at the end of January 2003. There are no limits for further going ideas except for the programmer's skills. But now to the last section, the news. The German "Bundesamt für Sicherheit in der Informationstechnik"  (Federal Office for information technology security) ships Knoppix  CD-ROMs. If you send them a post-paid readdressed C5 envelope, the German BSI will send you a GNU/Linux distribution running completely from CD. You can find more information about this on their Knoppix page . Although some time has passed, I want to mention it here once again. At the end of October 2002 the OFSET - Organisation for Free Software in Education and Teaching  released the first version of Freeduc . It's a distribution based on Knoppix  whose main purpose is the demonstration of free educational software. Similar to Knoppix all of Freeduc's software runs directly from CD and you don't need to install anything. Thanks to the very good automatic hardware detection you don't need to configure anything yourself too. On one of the next days or weeks they want to release the version 1.2 and I think we can eagerly look forward to it. Well, this was the fifth edition of TGS. But before I say good bye for this time there are still some questions left: After the last publication of TUX&GNU@school someone on pro-linux.de  asked if it would be possible to receive the new edition by newsletter too. Because I don't think the idea is bad I want to ask now whether there is interest in general for such a version ? For this all persons who are interesting in a newsletter version should send me  an email till the next edition, please. Of course as ever I'm interested in questions, criticism, comments and hints which should be sent to the same location. But now that's really the end of this time. Good luck and a happy new year is the last I want to say. Meta packages of Debian Jr.
Mario Fux finished 1999 the PrimarlehrerInnenseminar in Brig after he made up mathematical and natural scientifical matura. In a body with two colleagues he founded the "ALIS - Arbeitsgruppe Linux an Schulen" (Swiss work group for linux at school). Meanwhile he studies at the Swiss Federal Institut of Technology Zurich informations technology and electrical engineering. And if he once doesn't spend his time in front of the PC, he sits at his nature pond in the mountains. Copyright (c) 2002 Mario Fux. Permission is granted to copy, distribute and/or modify this document under the terms of the GNU Free Documentation License, Version 1.2 or any later version published by the Free Software Foundation; with no Invariant Sections, no Front-Cover Texts, and no Back-Cover Texts. A copy of the license can be found at http://www.gnu.org/licenses/fdl.html.